Sitting on the top of Pasumalai Hill, The Gateway Hotel Pasumalai stretches over 62 acres of peaceful landscaped gardens. It has an outdoor pool, tennis courts and an Ayurvedic treatment centre. The Gateway Hotel Pasumalai enjoys beautiful views of the famous Meenakshi Temple, Madurai City and Kodai Hills. It is 15 km from Madurai Airport and a 15-minute drive from Madurai City Centre. 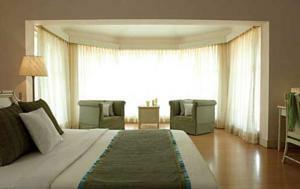 The spacious rooms feature either classic or modern interiors, all equipped with a satellite TV and a minibar. Most rooms have large bay windows with garden views. Private bathrooms come with a bathtub. Day trips and car rentals can be arranged at the tour desk. Guests can also play table tennis and badminton, or make use of the business centre. Laundry services are also available. Local and international dishes are served at GAD restaurant. The charming Harvey's Lounge Bar offers imported liquors and a billiard table. Rooms: Hotel Rooms: 63, Hotel Chain: Taj Hotels & Resorts. Free! One child under 5 years stays free of charge when using existing beds. One further older child or adult is charged INR 575 per night and person in an extra bed. Maximum capacity of extra beds in a room is 1. Any type of extra bed or child's cot/crib is upon request and needs to be confirmed by the hotel. Supplements will not be calculated automatically in the total costs and have to be paid separately in the hotel.